The Gamma-Spect-2×2 is a camera-core for hyperspectral x-ray and gamma-ray imaging. The device has 26-cm2 sensitive area (5.1cm x 5.1cm) and 1.6-mm spatial resolution (pixel pitch of 1.6mm). The sensitive area is pixelated with 1024 pixels (32 x 32). Each pixel is sensitive to x-rays and gamma-rays in the energy range from 20keV to 700keV with about 6keV FWHM energy resolution. The device can be fitted with various collimators to provide imaging capability (pin-holes, coded-apertures, and all types of multiple hole collimators). The Gamma-Spect-2×2 camera-core is based on cadmium zinc telluride (CZT) radiation sensors. The sensor can be operated at room temperature without cooling. Each sensor pixel is read out by charge sensitive amplifiers implemented on an integrated circuit. The Gamma-Spect-2×2 camera-core can be mounted in any orientation and can be combined with more units to build systems with larger sensitive area or curved geometry. 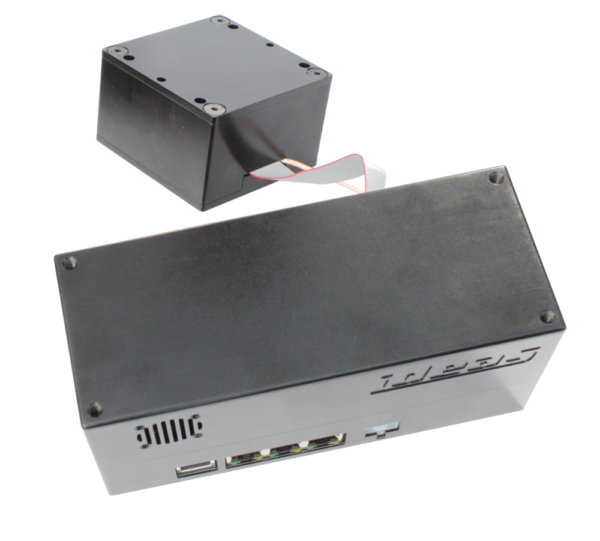 The Gamma-Spect-2×2 connects to external systems via a standard Ethernet network interface. technologies Hyperspectral x-ray and gamma-ray imaging, single photon counting, energy resolved counting, photon timing, energy spectroscopy, imaging.